Stacy Ritter, president and CEO of the Greater Fort Lauderdale Convention & Visitors Bureau, led the destination&apos;s 2019 Marketing Plan presentation luncheon at the Broward County Convention Center. The “House of GFL” backdrop is inspired by an experiential pop-up marketing initiative rolling out nationwide in 2019. GREATER FORT LAUDERDALE, Fla. (October 4, 2018) – Today more than 500 hospitality industry partners gathered for the Greater Fort Lauderdale Convention & Visitors Bureau’s 2019 Marketing Plan presentation. The 2019 marketing roadmap, which launched October 1, reflects the destination’s image transformation and includes robust, research-driven marketing initiatives – identifying lifestyle, demographics and spending data – to grow its more than 14 million annual visitors. Applying in-depth qualitative and quantitative research data, Greater Fort Lauderdale has defined key audience personas, representing unique consumer groups for growth potential, to develop integrated marketing communications initiatives. This sophisticated persona strategy will allow hyper-targeting and customization – from distinct language to visuals – throughout all consumer touchpoints including website content, editorial outreach, traditional advertising, public relations, social media, online engagements, etc. Also announced is a significant CVB initiative for 2019, DestinationNEXT, a destination diagnostic tool developed by the Destination Marketing Association International (DMAI) and InterVISTAS Consulting, to assess how Greater Fort Lauderdale scores as a tourist destination. The assessment serves as a scorecard and benchmark for opportunities to attract and inspire visitors to the destination. The Greater Fort Lauderdale Convention & Visitors Bureau (GFLCVB) 2019 Marketing Plan is developed and supported, in cooperation with the GFLCVB, Tourist Development Council and Marketing Advisory Committee, as well as the bureau’s advertising and public relations agencies of record, Starmark and Finn Partners, respectively. For more information and a copy of the 2019 Greater Fort Lauderdale Convention & Visitors Bureau’s Marketing Plan, visit sunny.org/partners. Visuals of the 2019 Marketing Plan initiatives are available upon request. 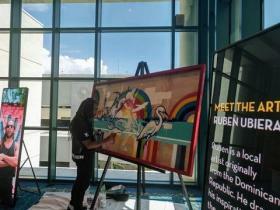 Local artist, Ruben Ubiera, created a painting during the Greater Fort Lauderdale Convention & Visitors Bureau’s 2019 Marketing Plan presentation luncheon. Ubiera, known best for postgraffism genre urban murals, has creative works in FATVillage and the Downtown Hollywood Mural Project. His visionary talent is also responsible for the #GreaterTogether thumbprint mural symbolizing the destination’s diversity campaign. Alex Di Leo, recording artist, singer-songwriter and Fort Lauderdale native, performed during the Greater Fort Lauderdale Convention & Visitors Bureau’s 2019 Marketing Plan presentation luncheon. Di Leo performed at the 2017 Riptide Music Festival and the South By Southwest (SXSW) music festival in 2018.